The Philadelphia Eagles are Super Bowl champions because they weren't intimidated and wouldn't back down just like their coach. "We just wanted to stay aggressive," Pederson said. "My mentality coming into the game was that I was going to stay aggressive with Nick (Foles), and allow his playmakers to make plays. They made one big play after another in a 41-33 victory over the New England Patriots on Sunday night to win the franchise's first NFL title since 1960. Pederson was criticized for being too aggressive in his rookie season when the Eagles were 7-9. He didn't change his philosophy this year, but his players executed the plays. "A quarterback going out on a route? I was pumped to go over there and talk to Doug and we agreed to do it," Foles said. "We worked on it for a long time and executed perfectly. We've been working on it for a month." Burton was recruited as a quarterback out of high school by Florida. 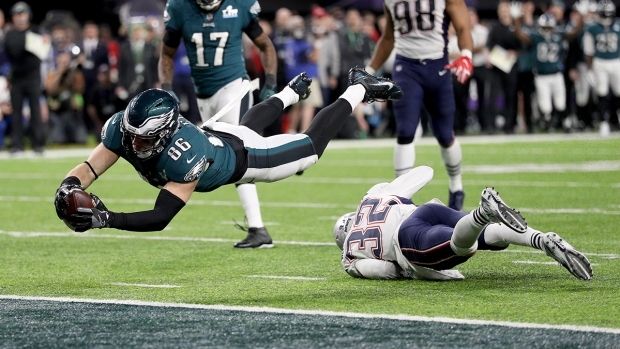 He was confident he'd make the right throw and Foles would make the catch on a play called "Philly Special." "Coach has some guts," Burton said. "People don't realize how great of an athlete Nick is. I would've thrown to him even if he was covered. He would've gone up to get it." Other teams who failed to topple New England after taking leads in playoff games were too conservative. Atlanta blew a 28-3 lead in last year's Super Bowl and Jacksonville had a 20-10 fourth-quarter lead in the AFC championship game. "We wanted to be aggressive," running back Jay Ajayi said. "We understood that this is a team that doesn't quit, that plays four quarters and we were going to have to be aggressive all game long. We showed that. We wanted to set the tone early and we wanted to keep our foot on the gas." Pederson's aggressive nature almost backfired when he went for a 2-point conversion early in the second quarter because Jake Elliott had missed an extra point on the team's first score. When it failed, the Eagles led 15-3 and that loomed large when they fell behind 33-32 in the fourth quarter. But Pederson didn't hesitate going for fourth-and-1 from the Eagles 45 with 5:39 left in the game and the team trailing by one point. Foles tossed a 2-yard pass to Zach Ertz and later connected with Ertz on the go-ahead TD pass . "Doug has been aggressive since he came here," Ertz said. "That's part of our identity. It's a big reason we're here and now we're champions."